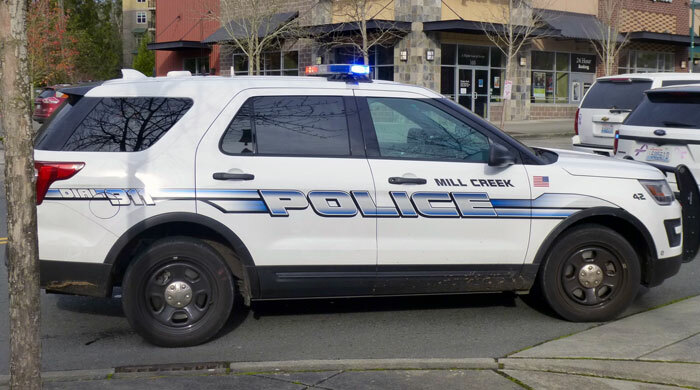 According to the latest Mill Creek Police Blotter, a total of 474 responses were reported the week of June 22nd to June 28th, 2018. 00:02:52 - 3300 BLK 132ND ST SE: Officers responded to a report of a DUI in the 3300 block of 132nd St SE. Upon contact and investigation it was determined that the male was in fact driving under the influence and was subsequently processed and booked in jail for DUI. 18:26:44 - 3300 BLK 132ND ST SE: Officers assisted Edmonds Police Department in the apprehension of a Robbery suspect in the 3300 block of 132nd St SE. A 21 year old male from Everett was taken into custody and transferred to Edmonds Police custody. 3:12:15 - 13600 BLK NORTH CREEK DR: Officers responded to an alarm located in the 13600 block of North Creek Dr. A 44 year old male from Everett was contacted after he removed and destroyed a security camera from a secured facility. The male subject was apprehended and booked into the Snohomish County Jail for Malicious Mischief 2 and Criminal Trespass 1. 18:50:11 - 16100 BLK 25TH AVE SE: Police arrested a Mill Creek man near the 16100 block of 25th Avenue SE for driving with a suspended license. 23:46:36 - 14400 BLK BOTHELL EVERETT HWY: Mill Creek Police assisted the Washington State Patrol with the DUI arrest of a Mill Creek woman near the 14500 block of Bothell-Everett Highway. 07:22:57 - 1000 BLK DUMAS RD: A Mill Creek officer responded to a blocking collision in the 1000 block of Dumas Rd. The driver was subsequently arrested on an unrelated offense. 11:53:54 - 15728 MAIN ST: Officers responded to City Hall, where a 64 year old Bothell man turned in a wallet he had found within the city. 23:05:27 - 15700 BLK BOTHELL EVERETT HWY: Police conducted a traffic stop near the 15700 block of Bothell-Everett Highway and subsequently arrested and booked an Everett man into the Snohomish County Jail for driving while license suspended in the 2nd degree and operating a vehicle without an ignition interlock system. 10:35:59 - 15728 MAIN ST: PSO took a found property report for a baby stroller, which was left at 15700 block of Main Street. 19:49:10 - 16400 BLK BOTHELL EVERETT HWY: Officers stopped a vehicle in the 900 block of 164th St SE for a suspended registered owner. A 51 year old Lynnwood female was cited and released for DWLS 3rd Degree. 19:51:53 - 13700 BLK NORTH CREEK DR: Property associated with the retention pond at the 13700 block of North Creek Drive was tagged with graffiti by an unknown male. 21:12:08 - 1000 BLK 132ND ST SE: An officer contacted a male interfering with traffic in the 1000 block of 132nd St SE. A 21 year old male from Mill Creek was arrested and booked into the Snohomish County Jail for an outstanding warrant. 21:13:23 - 13500 BLK NORTH CREEK DR: Police responded to the 13500 block of North Creek Drive and took a theft report after a Mill Creek woman reported that her son's bicycle had been stolen. 23:08:27 - 16800 BLK BOTHELL EVERETT HWY: Mill Creek Police contacted three subjects that were trespassing on private property near the 16900 block of Bothell-Everett Highway. All three were issued trespass notices and one of them, an Everett man, was arrested and booked on an outstanding warrant. 16:25:30 - 14600 BLK 32ND DR SE: PSO took a found property report for a cell phone, which had been found at 14600 block of 32nd Dr. SE. Click on this link to see the June 22nd to June 28th, 2018, Mill Creek Police Blotter.